As far as weeks go, they don’t come much bigger than the following seven days for the Lewes U18s. 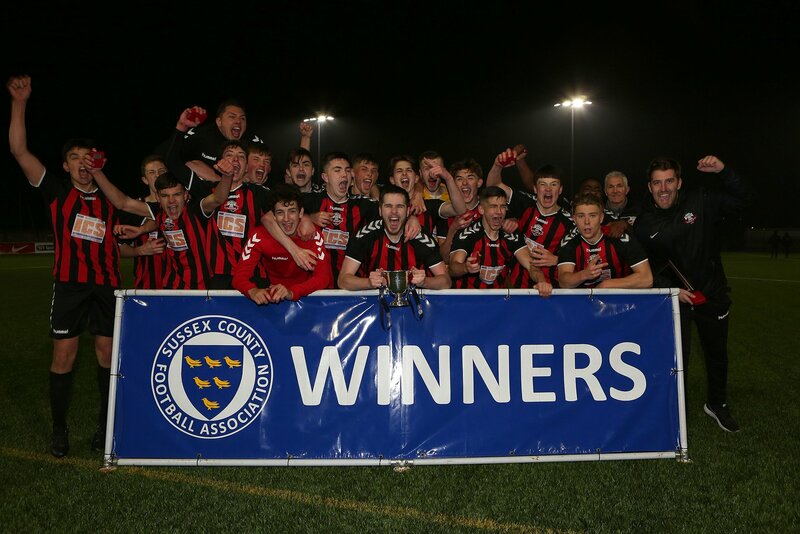 The reward for a tremendous season for Dale Hurley’s boys is the chance to create history and bring home the Sussex Youth Cup and Isthmian Youth League double – something the club have never achieved. First up is the Sussex Bluefin Dennis Probee U18s final against local rivals Burgess Hill Town on Thursday 11th April at Culver Road, Lancing, kick-off 7.15pm. In recent years these two clubs have had their hands on this trophy more than any other – both have four Sussex Youth Cup wins since 2005. Rooks fans will need no reminder of the dramatic penalty shoot-out victory against Whitehawk last season. There were plenty of heroes that night but it was left to Dane Tasker to make a couple of superb shoot-out saves, while Leone Gravata calmly dispatched his spot kick into the bottom left-hand corner to bring the trophy home to the Pan. Before last season’s win, the young Rooks last success in this competition was six years ago when they were victorious over this year’s opponents, Burgess Hill Town. The route to this season’s final started back with a 7-2 win at Newhaven back in November, which continued with comprehensive wins against WorthingUnited (3-0), Southwick (3-0) and an excellent 4-2 victory over Eastbourne Borough in the semi-final at Priory Lane last month. Top scorer in this competition has been Dylan Gifford with 4 goals, while throughout this season the goals have been spread throughout the squad. Gifford leads the scoring charts with 22 goals from out wide, while striker James Waters has weighed in with 15, as well as impressive returns from skipper Ross Barclay (13), forward Jay Popham (13) and winger Mitch Hewens (10). In fact, the U18s have scored a sensational 120 goals in just 28 matches this season, and equally impressively only conceding 28 at the other end! In the two meetings between the clubs this season it’s been advantage Rooks – a hard fought 3-1 win at Green Elephant Stadium with Headland, Barclay and Popham amongst the goals, while a 3-0 win was secured at the Pan in February, Waters, Hewens and Gifford scoring. In the Bostik Youth League table, Dale Hurley’s boys hold top spot with one game to play, while the Hillians have had a solid season and have completed their fixtures to finish in fifth. It should be a cracking showpiece final so please come along to support your future Rooks. Kick-off is at the earlier time of 7.15pm while admission is only £3 for adults, £2 for OAPs and children under 16 are free. And a date for your diaries - next Thursday, 18thApril, we host South Park U18s in our final league game of the season. It’s all down to the final game of the season to decide whether us or Worthing U18s become League champions – we’re currently top on goal difference but anything could happen over the course of those final 90 minutes. It’d be amazing to get a big crowd in at the Pan to hopefully cheer the lads onto victory and the title.